Today we’re focusing on the ever-elusive topic of gluten-free baking! 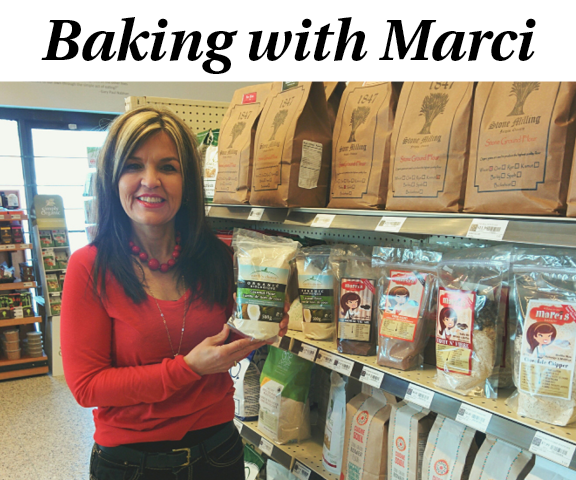 Marci is a local baker who has her Nurse’s Accreditation in Celiac’s Disease and a Diploma in Celiac’s Disease and the Gluten Free Lifestyle. She’s also a member of the co-op! She is hanging around the store most Wednesdays and Thursdays and would love to help you with any questions about gluten-free baking, nutrient-dense baking, or dietary improving tips. Marci is also the creator of the very popular “Well Bread”. This bread is not only gluten-free, but it’s also vegan and contains no cane sugar. It’s fresh and delicious, but each slice also provides a healthy dose of fiber and protein! Marci recommends it for sandwiches or toast, but also suggests it as a great hostess gift with a ribbon tied around it. Pop by the co-op and pick up a loaf for yourself! Who doesn’t like to have a sweet treat now and then? “I’m more about NOW, rather than then,” says Marci. The tougher question she suggests is: can you indulge in a sweet craving that can actually be healthy too? Oh yes! Coconut flour is one of the healthiest flours out there, and when you bake with it, you add all that goodness to your treat! It’s a gluten-free flour made from ground coconut meat. It’s also grain-free, low carb, contains more fibre than any other flour available, and has a decent amount of protein. Most importantly, it imparts a really enjoyable flavour whenever it’s used! When trying to substitute it in your baking for the first time, Marci recommends that you try 1/8 cup in place of your usual flour and increase your liquid by ¼ cup. Since Marci’s Bakery is all about the healthiest, nutrient rich baking they can produce, here is a recipe that uses coconut flour to make a gluten free, vegan, no grain, no cane sugar square that tastes fantastic. 1. Preheat the oven to 350F. Line an 8×8 or 9×9 baking pan with parchment paper. 2. 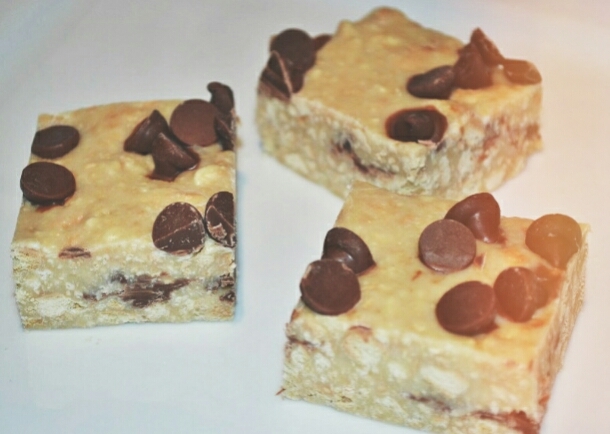 Put all of the ingredients except the chocolate chips into a blender or food processor. Process, using on/off pulses, until mixtures starts to blend into batter (pulsing helps the machine motor not to be overworked). Then, process on High for 15-30 seconds until smooth. 3. With a spatula, spread the batter into the prepared pan. Smooth out the top. Sprinkle with chocolate chips. 4. Bake in preheated oven for 25 minutes or until golden brown and surface feels dry. Cool completely in pan. Cut into 16 squares. Serve with love!